Modified prone position: The patient is positioned in the prone position with mild extension. 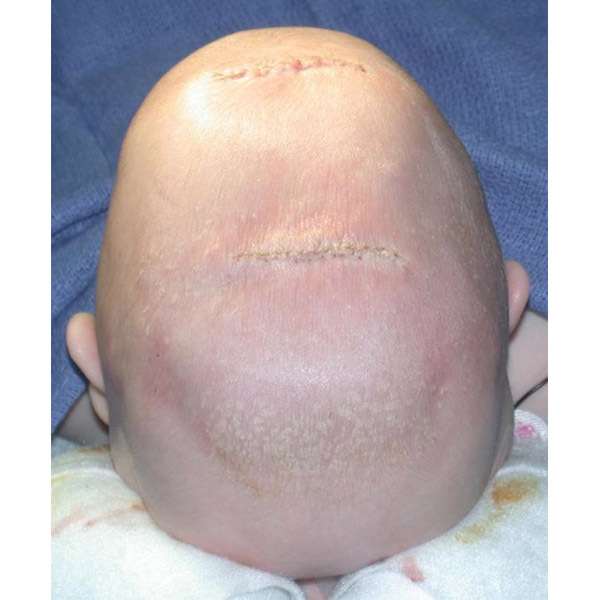 Scalp incisions: Two approximately 3-cm incisions are made at either end of the sagittal suture with their midpoints over the suture. The anterior one is placed behind the fontanelle, and other is made just anterior to lambda. Subgaleal plane developed: A plane is made above the pericranium that extends from the anterior fontanelle, past the second incision, to the posterior end of the synostosed suture. The width is a little greater than 4 cm. Similar dissection should occur at the points of barrel staving. This should include the anterior and posterior parietal regions. Cut pericranium: The author does not strip the pericranium. Instead, it is incised on the bone where the scissor or drill cuts will be. Drill bur holes: Four bur holes are made, two on either side of the each incision. They should be 4 cm apart with the mid-portion of them at midline. The bur holes are connected with the drill and a Kerrison. Cut and remove posterior sagittal suture: First, the small portion of sagittal suture is removed in the posterior direction from the posterior incision toward lambda since the blood loss is minimal. The pericranium is coagulated off the bone 2 cm on either side of the suture for a total of 4 cm removal. The dura is stripped from the inner table with a #3 Penfield dissector in the posterior direction using a microscope, Loupe and lighter retractor or endoscopic assistance are used. The diamond drill is used to make the initial troughs in the bone. Scissors are used to remove the bone piece. Bone bleeding is stopped with large pieces of hemostatic gelatin sponge pressed into the bone edges or suction electrocautery. Barrel stave parietal plates posteriorly: Barrel staves are made from this craniotomy downward toward and including the temporal squamosal suture. Dissection of the subgaleal plan and dura is as above. The majority of the bone work is done with the drill and finally with scissors. Any bone bleeding must be stopped. Cut and remove anterior sagittal suture: Next, the trough/strip of pericranium is incised about 2 cm off midline on either side extending from the anterior to the posterior incision. The osteotomy should be about 4 cm. the dura is removed using the microscope, Loupe and lighter retractor or endoscopic assistance are used. The diamond drill is used to start the osteotomy, and it is completed with heavy scissors. This size strip should be wide enough to prevent re-fusion and kept to a minimum to avoid the need for future cranioplasty (7). Bleeding from the bone edge may be stopped with large pieces of thrombin and Gelfoam or the tonsillar coagulation/suction device. Remember to protect the dura. Remove the small piece of bone that extends from this osteotomy to the anterior fontanelle in a similar fashion. Barrel stave parietal plates anteriorly: Next, the pericranium and dura are removed off the inner table with microscope, Loupe or endoscope assistance for the anterior barrel staving is used. The V-shaped osteomies are made toward and include the squamosal suture posterior to the coronal suture (25). Standard closure: Galea is closed with absorbable suture and the skin is closed with a running absorbable skin suture. The hair is shampooed with nondrying shampoo such as baby shampoo. Bacitracin ointment is placed over the wound. No head dressing is placed. 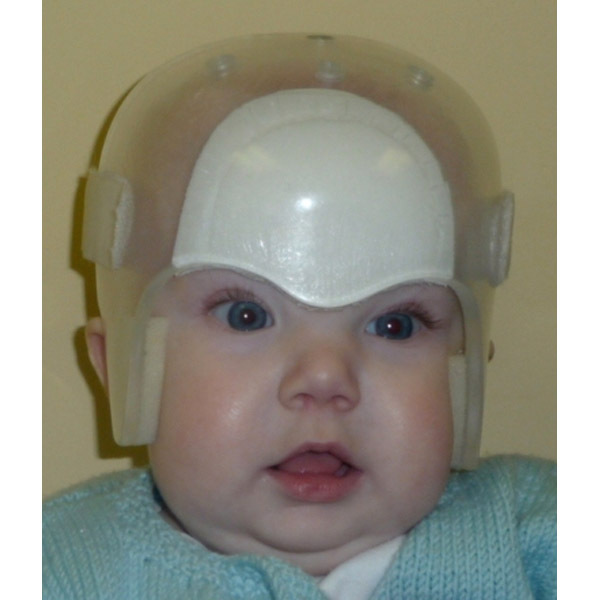 Helmet fitted several days after surgery: Allow 3–7 days for the surgical swelling to subside before fitting the child for the custom molding helmet. Supine: The patient is placed in a supine position on a horseshoe. Single scalp incision: One 2–2.5 cm incision is made at the midline of the fused coronal suture approximately midway between the pterion and the anterior fontanelle. Subgaleal pocket created exposing suture: A pocket is created between the galea and the pericranium toward the pterion and the anterior fontanelle. A lighted rhinoplasty or other small-lighted retractor is used to help dissection with the microscope, or loupes or the endoscope may be used. Use a needle tip unipolar cautery set on 12-15 W.
Bur hole at incision site: A 5-7 mm bur hole is made at incision using a diamond drill bit. The dura is off the inner table with a Penfield 3# extending from the anterior fontanelle and to the pterion. The endoscope, loupe, or microscope may be needed to visualize this stripping all the way to the pterion. Osteotomy to fontanelle and lesser wing sphenoid: A 5-mm osteotomy is made from the bur hole to the anterior fontanelle. This can be done with a microscope, endoscope, or simply retraction of the skin to the anterior fontanelle. The author prefers to use the diamond drill with dural protection if the bone bleeds easily. Otherwise, heavy scissos or rongeurs are used. The 5-mm osteotomy is continued toward the lesser wing of the sphenoid. Hemostasis is achieved with a thrombin soaked hemostatic gelatin sponge or cautery. The dura is protected during the latter. Standard closure: The galea is closed with absorbable suture, and the skin is closed with running absorbable suture. The hair is shampooed with nondrying shampoo such as baby shampoo. Bacitracin ointment is placed over the wound. No head dressing is placed. Helmet use preferred: Head helmets are used for improved cosmetic results. Helmet molding can be started 3 days to 1 week after surgery. 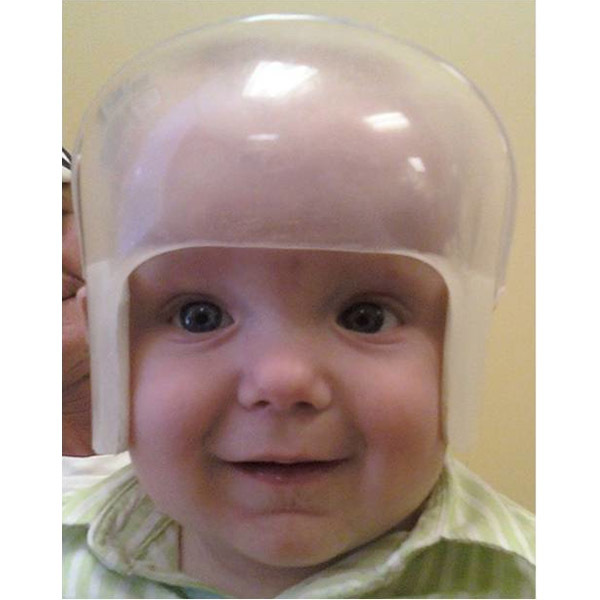 Helmet therapy may be require for up to 1 year. Supine: The patient is placed in supine position on a horseshoe. Single scalp incision: A 2-cm incision is made directly behind the hairline in the midline. The incision may be larger if a microscope or loupe dissection is used. Midline bur hole: A 5-mm bur hole is placed at the midline of the skull over the sagittal suture at its junction with the metopic suture. Subgaleal pocket to expose suture: A pocket is made above the pericranium to the nasofrontal suture. The pericranium may be removed off this area. Establish epidural plane: The endoscope may be used to remove the dura from the inner table down to the nasofrontal suture. Osteotomy from fontanelle to nasofrontal suture: A 5-mm osteotomy is made from the anterior fontanelle to the nasofrontal suture. The author does not use heavy scissors on this portion because of the bleeding that may occur at the nasofrontal suture. Instead a diamond bit is preferred to complete the osteotomy. A combination suction unipolar cautery instrument or unipolar cautery with lighted suction is used. If using the microscope or loupe guidance with lighter retractors, the osteotomy is moved toward the nasofrontal suture with the dura being stripped off the skull at each step using microscopic or loupe visualization. Potential for bleeding at nasofrontal suture: Caution is required with regard to venous anatomy toward the region of the nasofrontal suture. Heavy bleeding may occur but can be easily stopped with bipolar cautery or temporary packing with thrombin soaked hemostatic gelatin sponge. Standard closure: The galea is closed with absorbable suture and the skin is closed with running absorbable skin suture. The hair is washed with gentle shampoo, and bacitracin ointment is placed over the wound. Molding helmets preferred: Head helmets are used for improved cosmetic results. The application may be done 3 days to 1 week postoperatively. Helmet therapy may be required for up to 1 year. Prone: The patient is placed in prone position. Single scalp incision: A 2.0-cm incision is made along the synostosed suture midway between the skull base and bregma. The skin is opened with a needle tip unipolar cautery on 12-15W and the galea is opened from the inside out with coagulation as described under open repair of sagittal craniosynostosis. Create subgaleal pocket along suture: The subgaleal plane is opened in each direction. Single bur hole: A 5–7 mm bur hole is made in the middle of the synostosed suture. Resect suture: If the endoscope is used, the dura should be removed to either end point of the suture. Cut with heavy scissor and remove the 5–7 mm osteotomy. If using roupe or microscopic assistance, the osteotomy may be made with the diamond drill bit and Rongeurs to remove the entirety of the suture. Standard closure: The galea is closed with absorbable suture. 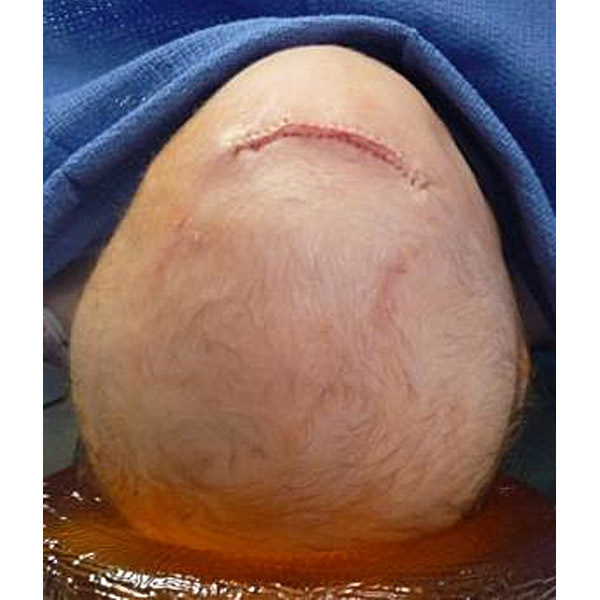 The skin is closed with running absorbable skin suture. The hair is washed with gentle shampoo, and bacitracin ointment is placed over the wound. Molding helmet preferred: Head helmets are used for improved cosmetic results.